Writing Strands is writing curriculum written by Dave Marks and published by National Writing Institute. Writing Strands is the first writing curriculum that we used. At a local Show and Tell homeschool meeting, I remember that some of the homeschool moms brought their Writing Strands books and recommended them with smiles on their faces. Their overall attitude when they spoke of the books influenced me to try them. During our first three years of homeschooling, I bought three of them and we liked them. In the image here you can see my son's writing binder and our three Writing Strands books. Our books are first edition. The new editions have new covers and some revised text but essentially, the editions are the same. Writing Strands is a casual and friendly approach to learning how to organize your thoughts to paper. The lessons are laid out in detail and each lesson is divided into days, such as day one, day two and so forth. Starting with book 2, each lesson has a language arts related subject. For example, in book two, lesson one's subject is adjectives, lesson two is listing, lesson three is reporting, lesson four is paragraphing, lesson five is ordering. Planning a school year of lessons would go something like this: Look at the contents to see how many lessons are in the book and if there are 18 or less, then plan to have a lesson every other week. Depending on the book that you are using, the lessons take 3, 4, 5, or 6 days. (I am not aware of any that take more than 6 days, but there might be a few.) Look ahead at each lesson to see how many days it could take. Keep in mind that the lesson could take more or fewer days than stated in the book. Note the expected amount of days on your planner to make certain that you do not plan too much. The image above is round-one work from lesson one in Writing Strands 2. 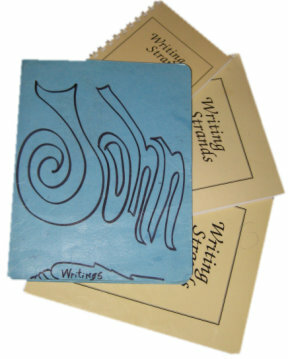 Writing Strands 2 is the first book in the series that is developed for students who have learned to write a simple sentence such as the top one in the image above. Later in level 2 your student will learn ordering and my older student wrote a paragraph with his ordered sentences. Midway through the book, your student will learn to write dialog and that can be quite fun if the students are allowed to use their imaginations. Some of my children's dialogs involved the conversations of our cat with a tree, a person, and other animals. I can ramble on, you know this is a casual review, right? If I were to describe the first 3 books, the ones we used, I'd say that the method used is a gentle and encouraging introduction to writing. It is creative and exploratory. I recommend Writing Strands. Because this is what I do, I have made a file to go along with this rambling review. It is a basic subject planner. Use it to lay out the possible flow of using Writing Strands. Lined Filler Paper - "Standard"
Standard. I call it standard filler paper because I used 3 standard rule sizes to measure the space between the lines. The sizes are wide rule, medium rule (college ruled), and narrow rule.